Building a business requires engagement, branding, and outreach. The minds behind growing your audience are media and marketing experts. Meet local media experts Scott Allen, Nick Armstrong, and Tim Wenger. I have been doing SEO for over 15 years and I still love it. Helping new and existing businesses improve their web presence is what I do best. I’m looking forward to the opportunity of speaking at Fort Collins Startup Week and hope to have many engaged business people in attendance. I took a tour of the West and loved the feeling I got in Fort Collins. So I moved here. Lots of great resources to make their startup successful and able to hit the ground running. A feeling of having helped people understand the search engines and how they work. A benefit to the people attending in any way I can. I’m a dad, author, Ignite and TEDx speaker, audio drama enthusiast, and award-winning serial entrepreneur. 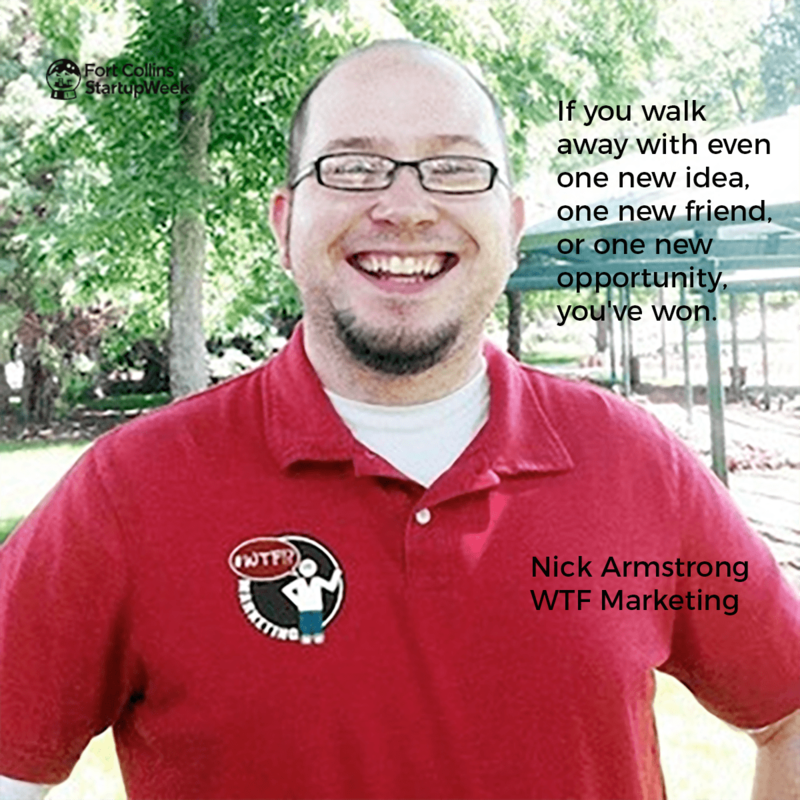 My company WTF Marketing has made marketing fun again for a large number of happy clients, including several multi-million dollar businesses and mom-and-pop shops in my hometown of Fort Collins, Colorado. I’ve even advised Fortune 100 businesses on marketing and technology. I leverage over a decade of hands-on marketing experience in building community and helping businesses tell stories, alongside over 15 years of web design experience. Alongside an amazing team of 13 other super-geeks, I built out Fort Collins Comic Con to benefit the Poudre River Public Library District and have raised over $45,000 for the Library and encourage youth literacy through comics. I love to be involved throughout my community and co-organize/help with events like TEDxFoCo, Startup Week Fort Collins, Ignite Fort Collins and more. I landed in wonderful Fort Collins, Colorado to earn my BS in Marketing and Computer Information Systems at Colorado State University, fell in love with the city, and never left. If you don’t walk away from FCIP: Startup Week edition (From Solopreneur to Multi-Person Business) with at least a few actionable tips on when, how, why, and with whom to grow your business, we either ran out of beer mid-talk, or you weren’t paying attention, or both. Growing beyond a ‘You-preneurship’ is a scary but necessary step if you ever hope to scale your time and energy. Don’t try to do all the things, pick one or two events, absorb everything you can, take notes, and make as many good connections as you can. If you walk away with even one new idea, one new friend, or one new opportunity, you’ve won. Fort Collins is expansive – in all the right ways. By providing a platform for all kinds of entrepreneurs and startups – from artists, creatives, and musicians to coders, techies, and makers, the city’s ability to solve 21st century problems like a world-class city should! Beyond the basics of employment, solving fundamentally complicated woes like homelessness, poverty, and inequality is all within reach with a well-established, communicative, and collaborative startup community. Tim Wenger is a Denver-based journalist and founder of Inkwell Media Services. He is the author of So, You Have A Band and a frequent contributor to Matador Network and MicroShiner. After finishing a BA in Communications from Fort Lewis College, Tim jumped into the back of a Ford Econoline and spent a few years playing guitar in dark bars while falling in love with travel, good food, and local drink. He’s been unable to rest his pen (or his feet) ever since. I’ve been part of the front range music community since moving back up here in 2009 with my band, Oatie Paste. I worked as the Managing Editor of Colorado Music Buzz from 2011-2015, when I branched out and started Inkwell Media Services as a freelance business. Since forming in Sept. 2015, I’ve been doing a wide variety of media work for various clients including news and journalism, copywriting, PR, talent buying and event management, and anything else my clients need. The vast majority of musicians, as great as they may be at writing and playing music, need help with business side. Through my book, So You Have A Band, and speaking events such as Startup Week, I hope to pass along what I’ve learned as an editor, talent buyer, and musician to those looking to grow the business side of their music career. I sincerely hope people walk away with a better understanding of how to put their best foot forward in the industry. Make yourself easy to get ahold of. Carry business cards, and follow up with everyone you meet. List your email and phone on your business Facebook page and everywhere else you can. Your contacts are going to make or break you, so do everything you can to maintain them. I am very interested in learning how to scale a media business. I hope to watch presentations from business leaders discussing how they have started the process of taking themselves out of the day to day operations. Colorado is the place to be. We’re attracting all types of young entrepreneurs and hotshots to our state. Where we’ll be depends on how well we interact with those coming here with fresh ideas. Do we view them as competition? Or do we network, learn from, and work with/alongside them? That will be telltale sign.